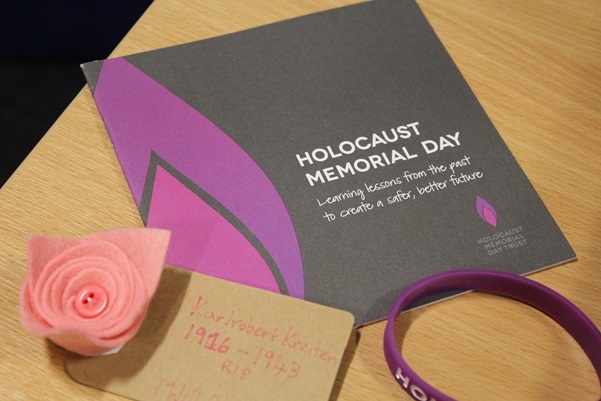 HMYOI Polmont and Fife College marked Holocaust Memorial Day with a moving event held on the 26th January. They were joined by Holocaust survivor Inge Auerbacher, Former United nations Ambassador Mukesh Kapila, and Claire MacAuley, a spokeswoman for Scottish Action for Refugees. 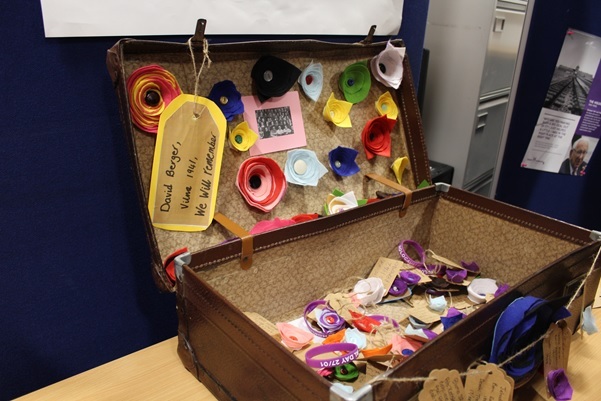 Students took part in the HMT project for eight weeks with Fife College staff prior to the event and learned about survivors and heroes of the holocaust, read and wrote poetry, hand crafted over 100 felt flowers and produced a fantastic display using creative arts and multimedia. The evening started with a reception and buffet in the Learning Centre. At this time visitors, staff and students mingled with each other. The 14 students who completed the Holocaust Memorial Trust's Youth Champion award acted as guides and ushers. One student interviewed Inge for the radio station and other students spent time showing guests around the exhibition they had planned as part of Holocaust Memorial Day. The exhibition was a fantastic display of all the hard work and effort by all involved. There was wall displays of British heroes of the holocaust, inspirational stories of survival, and even an interactive computer display where people had the chance to watch survivor stories they may not otherwise see, and perhaps the most moving part of the exhibition was an original 1940's suitcase filled with beautiful, ornate felt flowers. 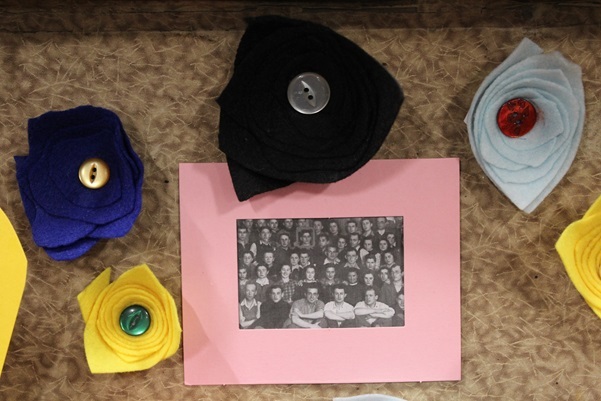 The flowers were attached to luggage tags with the names of people who had been killed in the Holocaust and subsequent genocides who have no one to remember them. Each visitor was encouraged to take a flower, and each year on the 27th January, remember their chosen person. After the reception, the 100 or so guests were led by the newly appointed Polmont Youth Champions to the Performing Arts space. It was here the students delivered a thought provoking presentation, followed by an inspiring reading of poetry that influenced the young people during their studies. The poetry was brought to an emotional conclusion with a heartfelt rendition of Robert Burns' A Man's A Man. The performance was followed by speakers, Mukesh, Inge, and Claire. In line with the theme for Holocaust Memorial Day, "Don't Stand By" the guests were privileged to listen to former United Nations Ambassador Mukesh Kapli. Mukesh spoke about his time as the ambassador and told of the times during the conflicts in Rwanda and how no one should stand by whilst injustices are happening. The audience were honored, in a first for HMYOI Polmont, to hear the inspiring and moving story of Inge Auerbacher. Inge spoke at length about her time in a Nazi concentration camp. The audience fell silent as Inge proudly displayed her yellow Star of David from her time in the camp. Inge reinforced a message that there should always be hope in the world. The full audience were captivated and visibly moved by Inge's story. The final speaker of the evening was, Claire MacAulay from Scottish Action for Refugees. She gave a motivational account of how she raised thousands of pounds to help refugees in Syria and people in Calais. As the event came to an end, there was a feeling of elation amongst the crowd. The sense of achievement and pride was clear when you looked around the faces of the young people, and staff involved. Not only did the young people achieve the Youth Champion Awards but many also achieved SQA's in Communication and Working with others, including one who is using this theme as a focus for his Higher Communications. This was a truly memorable night for all involved. Audrey Mitchell, Learning Centre Manager, commented that she was extremely proud of how hard the boys had worked in preparing and hosting this event. A truly special evening and one that will be remembered for a long time.